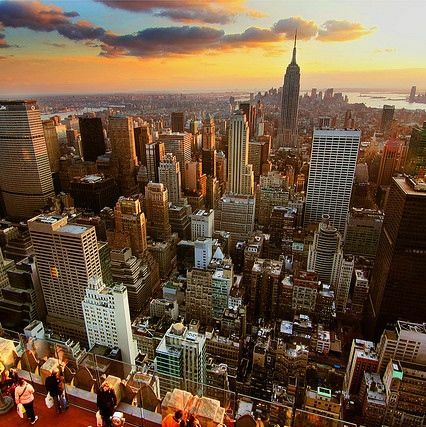 Image at top: New York City sunset by Flickr user Jerry Ferguson. 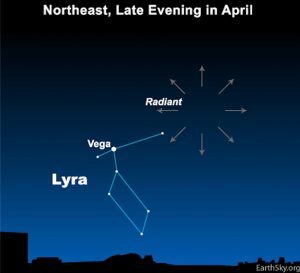 For the southernmost U.S. and similar latitudes – around 30 degrees north latitude – the earliest sunsets of the year happen in late November and early December. For latitudes further north – around 40 degrees N. latitude – the year’s earliest sunsets happen around December 7. That would be the latitude of New York City; Philadelphia, Pennsylvania; Kansas City, Missouri; Denver, Colorado; Reno, Nevada; Beijing, China; Madrid, Spain; and Naples, Italy. Southern Hemisphere? 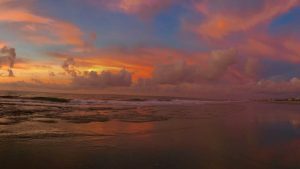 For 40 degrees south latitude, the year’s earliest sunrises happen around December 7, as you progress toward your year’s longest day at the December solstice. Closer to the Arctic and Antarctic Circles, the earliest sunset and earliest sunrise happen nearer the solstice. The exact date of the Northern Hemisphere’s earliest sunset and the Southern Hemisphere’s earliest sunrise varies by latitude. But, at temperate latitudes, both of these annual hallmarks in our sky come a few to several weeks before the December solstice, not on the solstice as you might expect. 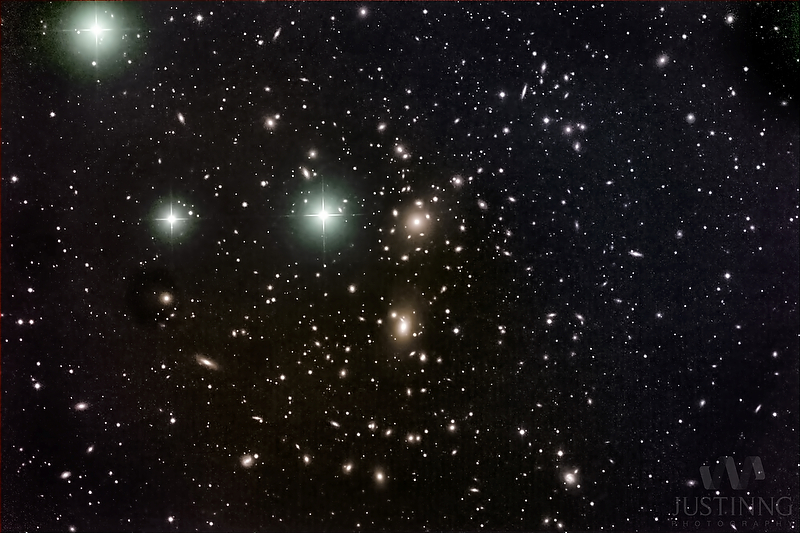 More about earliest sunsets below, but first … a quick aside for those of you with telescopes. 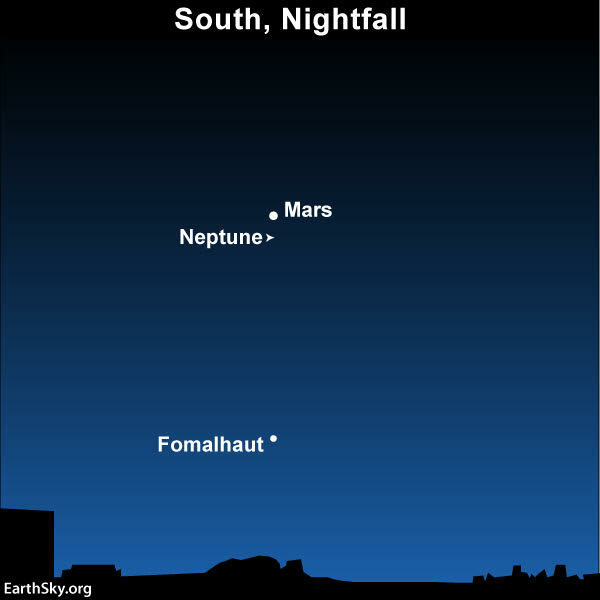 Mars and Neptune are in conjunction! Have an optical aid? Try spotting Neptune, the solar system’s farthest planet, close to the red planet Mars on the sky’s dome. 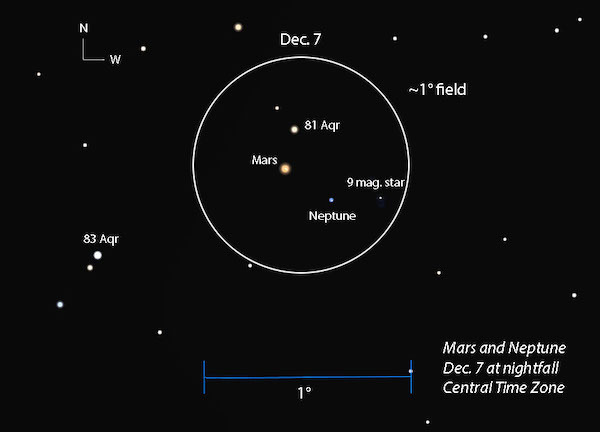 On December 7, 2018, Mars and Neptune showcase the closest conjunction of two planets in all of 2018. 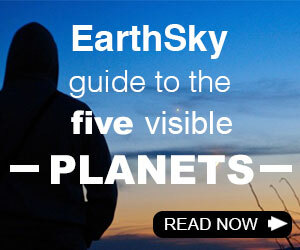 Read more from In-the-Sky or from SkyandTelescope.com. Neptune and Mars on December 6, 2018, from Wo Wehali in Atlanta, Georgia. View larger to notice their colors. Mars is distinctly reddish. Neptune is blue. Thanks, Wo! 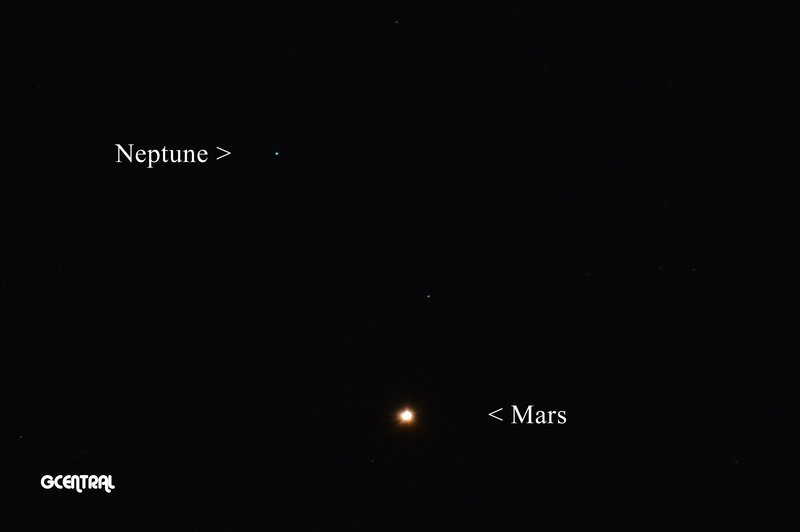 Mars and Neptune will be closest Friday night as seen from the Americas. 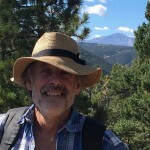 Read more from Bob King at Skyandtelescope.com. Okay … back to earliest sunsets! The next solstice in 2018 comes on December 21 and marks an unofficial beginning for winter in the Northern Hemisphere. For this hemisphere, this upcoming solstice brings the shortest day and longest night of the year. Why isn’t the earliest sunset on the year’s shortest day? It’s because of the discrepancy between the clock and the sun. A clock ticks off exactly 24 hours from one noon to the next. But an actual day – as measured by the spin of the Earth, from what is called one “solar noon” to the next – rarely equals 24 hours exactly. Solar noon is also called simply midday. It refers to that instant when the sun reaches its highest point for the day. In the month of December, the time period from one solar noon to the next is actually half a minute longer than 24 hours. On December 7, the sun reaches its noontime position at 11:52 a.m. local standard time. Two weeks later – on the winter solstice – the sun will reach its noontime position around 11:59 a.m. That’s 7 minutes later than on December 7. Click here to know the clock time for sunrise, solar noon and sunset plus day length in your part of the world, remembering to check the solar noon and day length boxes. The later clock time for solar noon also means a later clock time for sunrise and sunset. The table below helps to explain. As you might have guessed, the latest sunrises and sunsets aren’t on the day of the solstice either. For middle latitudes in the Northern Hemisphere, the latest sunrises come in early January. So there’s variation in the exact dates, but the sequence is always the same for both hemispheres. First: earliest sunset before the winter solstice, the winter solstice itself, latest sunrise after the winter solstice. 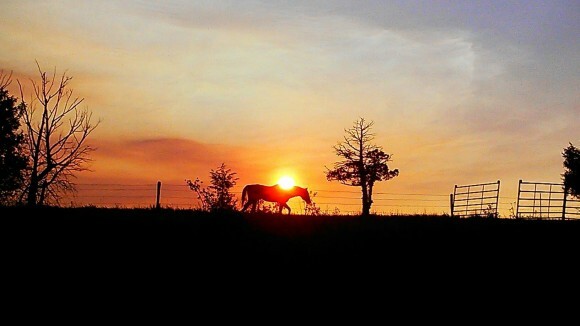 Half a year later: earliest sunrise before the summer solstice, the summer solstice itself, latest sunset. The earliest and latest sunsets and sunrises are lovely phenomena that happen around every solstice. People around the world notice them and often ask about them. Click here for more details on why the earliest sunset doesn’t fall on the shortest day. EarthSky Facebook friend Dutch McClintock in Livingston, Montana, took this photo. Livingston’s latitude is about 45 degrees N., so – for Dutch and all those living at that latitude – the earliest sunset will happen closer to the December solstice. 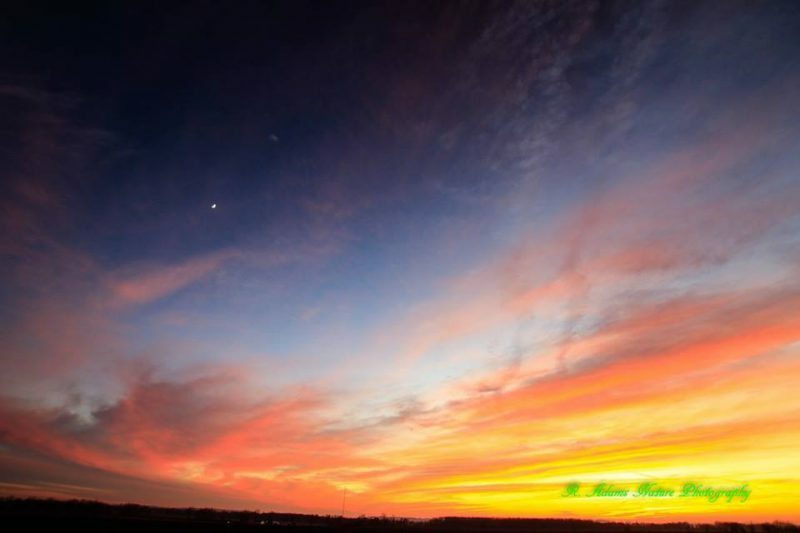 December sunset in Pike County, Illinois, via Russ Adams. The earliest sunsets for this location happen in early December. 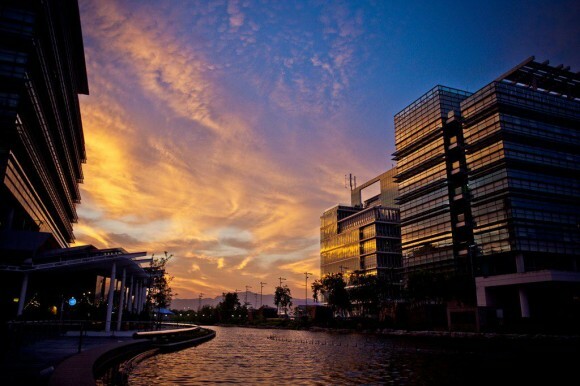 Hong Kong sunset, at the Hong Kong Science Park, from Kins Cheung. Hong Kong is at 22 degrees N. latitude, so the earliest sunset there has already happened. 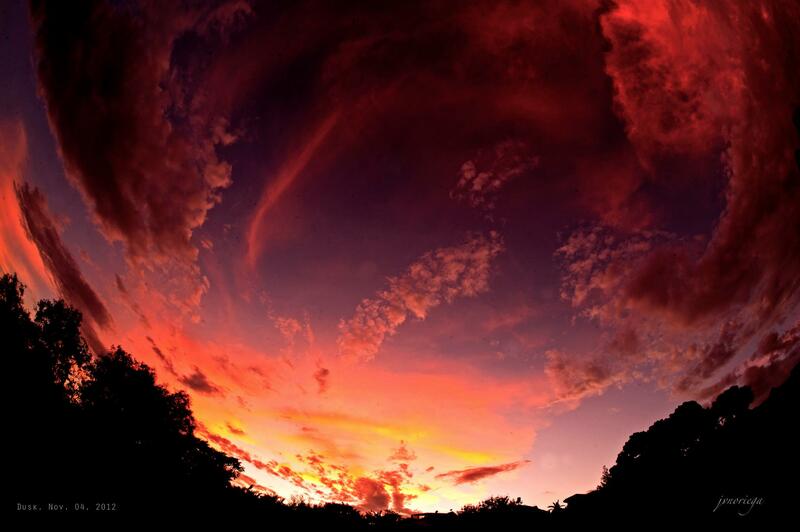 Sunset in Manila by EarthSky Facebook friend Jv Noriega. Manila is at 14 degrees N. latitude, so the earliest sunset there happens even earlier than in Hong Kong. Bottom line: The 2018 solstice comes on December 21, but the earliest sunsets at mid-northern latitudes – say, 40 degrees north latitude – happen on or near December 7. Latitudes closer to the equator had their earliest sunsets in late November, or earlier in December. Latitudes closer to the Arctic Circle have their earliest sunsets closer to the December solstice.